What I Love about the Gospel of Luke | When I Survey . . .
And so these early chapters of Luke might be a good place for me to start to tell you what I especially love about Luke. 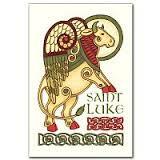 First, in Chapter 1, when the angel Gabriel comes to Mary, Luke emphasizes Mary’s humility and lowly origins. To this person of no consequence in the eyes of the world the messenger of God comes with startling news. Mary acknowledges as much saying, “(God) has looked with favor on the lowliness of his servant.” This is a major theme in the way Luke tells his story, that the vast love of God is not only for the well-born and privileged of this world, but for those with little social standing. In fact, in Luke Jesus warns that being rich and powerful is a hindrance to knowing God and experiencing the kingdom. Luke’s Gospel is full of reversals. His version of Jesus’ Sermon on the Mount (in Luke on a plain) is the only one with both “blessings” and “woes.” And one of his targets for woe is the rich. Why shepherds? Shepherds were nobodies! In those days, with the rise of the cultivation of crops, shepherds were looked down upon, and the job was often relegated to slaves or youngest sons (like David), people with no status. That the Good News of the Nativity first came to shepherds is typical of Luke and reminds the reader that the Gospel comes to all sorts and conditions of people without prejudice. Again, we see this theme in some of the parables of Jesus that are unique to Luke. For example, in the parable of the Good Samaritan (10.3-35), which is found only in Luke, Jesus tells of the good, respectable religious people (a priest and a Levite) passing by the wounded man on the other side of the Jericho road, while it is a Samaritan, who would have been despised by the good people, who showed compassion, stopped and tended to the poor man’s wounds. “Compassion” is a big word in Luke. The parable of the Good Samaritan reflects Luke’s universalism, his conviction that the Good News of Jesus Christ is for all people. Last week when we looked at Matthew you saw the genealogy of Jesus going back to David. In the New Testament genealogy is not about biology, but theology. Matthew is showing Jesus’ ancestry going back to King David, who was always the prototype for the expected Messiah. But Luke takes his genealogy of Jesus all the way to Adam, to show that Jesus is not only the Jewish Messiah, but also the Savior of the whole world. This expansive inclusivity is seen also in the parable of the Prodigal Son (15.11-32), which we heard today. In Luke, Jesus is saying that even those who are unable to reach out to God discover that God is reaching out to them, just as the waiting father in the parable ran out to his son. There is a telling phrase in the Parable of the Prodigal Son that I think captures what Luke believes about the Gospel. The prodigal has resolved to return home and beg for his father’s forgiveness. In vs. 20 it says, “So he set off and went to his father. But while he was still far off, his father saw him and was filled with compassion; he ran and put his arms around him and kissed him.” It is worth noting that the father ran out to him and embraced him before the son made his little repentance speech. But what I really want to focus on in this verse is the phrase “while he was still far off.” The phrase has been variously translated as “far away” or “at a distance.” For Luke, this is who God is, the one who waits for the return of those who are “far off.” And not only waits, but also watches and reaches out. This God, the God revealed in Jesus Christ, is the God of everyone, male or female, Greek or Jew, those keeping the law at home or running away to a far country. This God loves lepers, sinners, Samaritans and Romans, both the clean and the unclean, the righteous and the unrighteous. Nobody is too far off for the loving embrace of God. That’s what I love about Luke! This entry was posted in adult education, Bible, Bible study, Christian education, Christian faith, Faith, Grace, Jesus Christ, Lent, Love, Scriptures and tagged bible study, Gospel of Luke, Jesus Christ, Lent. Bookmark the permalink. I think Luke has more detail in his gospel – maybe that was because he was a doctor. At any rate -good post. Thanks for your comment. You’re right. Luke often fills in details when recounting the same stories as Mark and Matthew. Rick, as always, your sermons bring peace, hope and a unique view of the Gospels. You seem to know just when to “feed the hungry” thank you. I always appreciate your thoughts, Janet. I’m glad you found it helpful.